If you have even one cat you know how daunting it can be to clean the little box. In my house it’s become a chore for my oldest daughter. So when I told her we were getting the Litter Robot she was excited (saves her work). I was excited as well, as I love electronic and anything that makes life easier. When the Litter Robot came, it reminded me a little of a spaceship, but in a good way. I love the look and it’s lighter than I thought it was going to be (without the litter of course). From taking it out of the box and my cats being able to use it, it was only a few minutes. Make sure you read the instructions before using it as you need to set it up. Don’t worry, that really only means you pour your litter in and press a few buttons. After that, it’s ready for your fur babies to use. 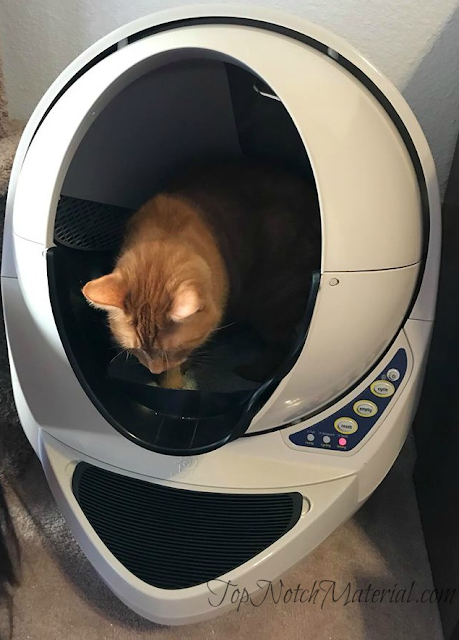 I love that you don’t need to use any special litter with the Litter Robot. It works with most any clumping or scoopable litter. If you use a newspaper or wood based, these won’t work. If you do use those, try and switch to the clumping and you will be good to go. After we set it up, we took both cats one by one and put them inside it so they could figure out what it was. If your cat is a little apprehensive about it like my Alexander Todd was, you can put a little bit of their other little box inside so the scent is there. My big orange guy Vin Diesel took to it pretty quick. I wasn’t surprised as he’s a little more adventurous than his brother. It didn’t take long though and they were both using it like their old one. Do you need any special accessories? Nope, you don’t even need to buy their bags if you don’t want to. You can use a regular kitchen garbage bag. This will save you time if you didn’t order them, or you just don’t want to. You can also go 7-10 days between bags, which is something you can’t really do with a regular litter box. 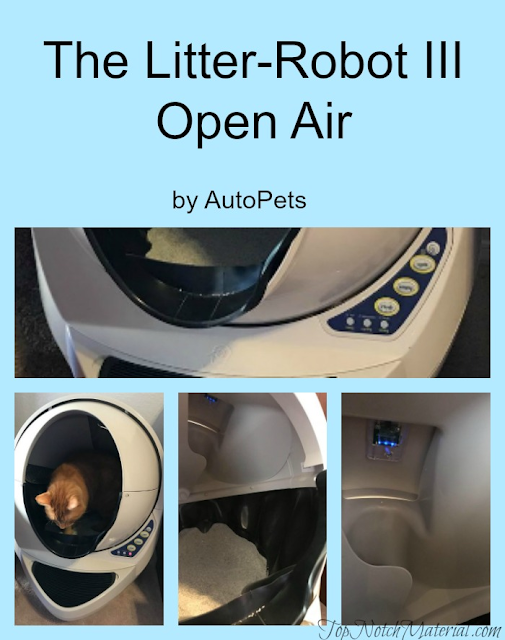 If you think this is right for you, I mean your cats, you can order right on Litter-Robot’s website. In the meantime, you can also enter to win one of your very own. Follow the rules below for your chance! I’d like to give this to my brother. He has aspergers and a cat that serves as a therapy animal. He could definitely use this. We need this for our cat! He is disabled and only has one eye so he often poops out outside of the litter box and can't cover it up very well. I love that this product self cleans and reduces odor. I love that it self cleans after each use! 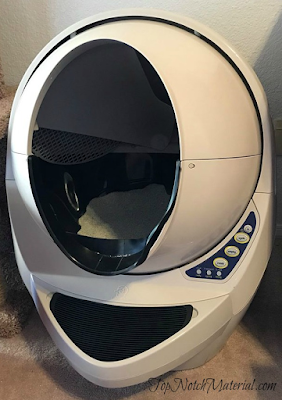 I would love to have one because cleaning the litter box daily is something I never seem to have time for with four kids. I have two cats and a very busy life. This would be absolutely perfect for me and my two felines! THIS WOULD BE AMAZING TO HAVE. I rescue cats and I have 23 right now in my home. ages from 2 months up to 10 years old. I started this after seeing the feral colony depleting and 3 of my cats getting shot by some of the local neighbors. The police can't do anything without proof of the shooter so I find them, trap them and foster them. I have two Litter Robots and six cats. One more LR would be purrfect. . I recommend the LRs to everyone. I like that it is selfcleaning and it would work great for out cats. We adopted a new cat (well adult) this Summer and let's face it..I am lazy as it has been almost a decade since I had a cat...some days I forget to sift the crapper box. I also know it would be great to help my husband clean up if I were to become pregnant again as it is not recommended for pregnant women to clean litter boxes. I would love this for my sister - she has a cat! Looks like a great product! Our cat is getting older and we need to move the litter box upstairs since the steps are really steep. Unfortunately our home is very small and we have a new young one in the household, so we are been looking for a product that can help us fit our niche. Seems like this would be the perfect item for that...and something price-wise we probably couldn't otherwise spend money on right now. 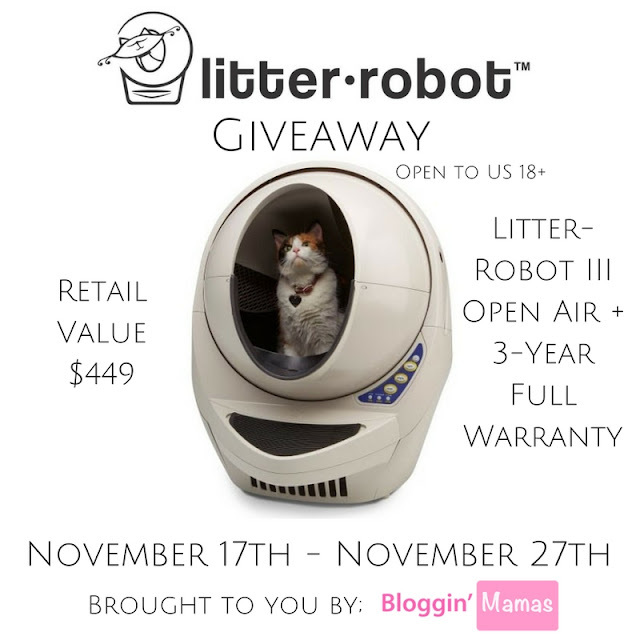 I would love to win this litter robot iii. It sounds amazing and even has an automatic nightlight. Ziva is the weirdest cat we have ever had. She has always used a litter box and rarely goes outside except when she runs out and runs right back inside. She drags trash bags, things out of the trash, rubberbands and hair ties, newspaper pieces and anything else she can drag from another room and puts it in her litter box. She does that each time she uses the litter box, which is pushed up against the wall in the extra bedroom. She doesn't cover her urine or anything else with litter, but stands on the edge of the box and scratches on the wall instead. Then she walks around searching for items to put in the litter box. I hope that an automatic box would put an end to her craziness. The vet says she is anxious. Anyway, I would love to win this automatic litter box because I think it might just solve her anxiety problems. Thanks for having such an amazing giveaway! 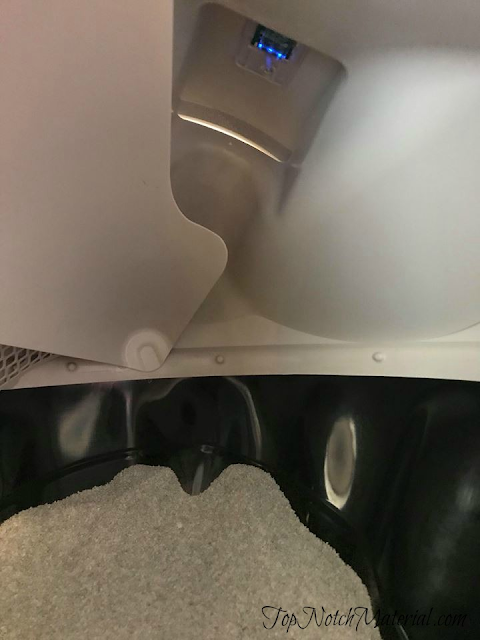 My cat, Naya, is almost 16 1/2 years old and has decided to change where she wants to use her kitty litter box. She chose my kids' bathroom which is very, very tiny and her box is gigantic which means even less room. My kids are fine with the arrangement but, would love this due to smaller size and ease of cleaning for me. I want to win because I need to change something up with my 12 year old cat, who just lost its companion and wants to use my bathroom floor now..... I think she might love this!